Want to Rock the Recruitment Process? Hey, everyone. I’m Chris McGown, with Gold Medal Squared, and you’re listening to The Volleyball Life podcast. Today, on the show, we’ve got Kara Hill. She’s the founder of My Recruiting Solutions, and it’s exactly what it sounds like. She works with athletes and with parents, and with colleges and universities to make sure that those recruitable athletes are getting a good fit, ultimately, when they head off to the next level. We go all over the place in this podcast. We talk about levels of success, or maximizing your success, as a parent, as an athlete, as a club coach, as a university or college coach. She has some really great insights, and I think you’ll really enjoy the conversation. You can find her online. Her website is myrecruitingsolutions.com, and she’s really active on social media, but I think you’ll enjoy the conversation. Thanks for joining us, and enjoy the show. 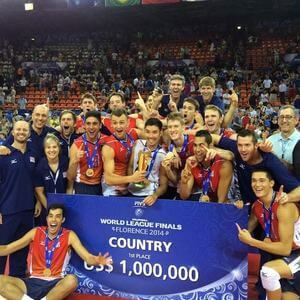 Chris McGown: Welcome to The Volleyball Life podcast, from Gold Medal Squared. I’m Chris McGown, and today, we’re talking with Kara Hill. She’s the founder from My Recruiting Solutions. Kara, thanks for joining us. Kara Hill: Thanks for having me. Chris McGown: Yeah. We’re taking a little bit of a different direction, here. Usually, we’re talking to volleyball coaches, or somebody that’s involved technically in the game. I’m excited to talk to you. This is the topic that, for sure, is, I think, on everybody’s mind that starts playing volleyball, that has the idea of, hey, at some point, I’d like to play at the next level, collegiately, and go from there. So, yeah, thanks again. Chris McGown: Tell me a little bit about how you got started, and your background, and what brought you into this line of work. Kara Hill: Sure. So, I played volleyball. I played at Ichiban Volleyball Club several years ago, and many, many, many, many moons ago. Played, I was recruited to play at Long Island University in Brooklyn, New York. Kind of thought I had my whole life planned out. It was not in the cards for me. I had, actually, a teammate’s dad had molested me, and I had to go through two trials in high school, so I wasn’t in an emotional place to go play at the next level. I ended up doing a lot of different things. I’ve always been very entrepreneurial. I had a lot of different careers, until about 8 years ago. I reconnected with one of my old volleyball coaches. His name was Chuck Kaulupali, and Chuck had reached out on Facebook and said, hey, come hang out with my team for the day. Which I did, and I was blown away by how much the sport had grown. It was really exciting to get back in the gym. Believe it or not, hearing all the whistles, and the squeaky tennis shoes was very refreshing to me at the time. Chris McGown: There’s some thing magical about that sound? Kara Hill: There definitely is. It felt like home. So, he was coaching an 18-2 team. He had a couple of players that were going through the process, and as they were asking questions, it was like a light bulb went off. It was like, yep, this is what I’m supposed to be doing. I went home that day. I called over 100 college coaches, and I just started asking them, I’m going to open up a recruiting service, and before you hang up on me, if you could just please share what you would be looking for from some body in this process. Just, if you could explain the perfect process, from a college coach’s perspective, and how you envision getting your top recruits. I spent a lot of time talking to coaches I’ll never forget. I had spent, actually 45 minutes, with Diane Short, on the phone, which we still laugh about this, to this day. But, she was so kind and generous with the information that she shared. It really helped mold my business. At that point, I had reconnected with other coaches, other people I had played for. I went to our region, the Southern California Volleyball Association, and sat down with Ann Davenport. Ann had remembered my story as a player. Obviously, a lot of people had known what had happened, because it had made the news, and it was kind of public. It was just nice to have their support early on. She had allowed me to put up a booth and come out to one of the first tournaments. That’s really where I started to gain contacts and start the business. That was in, I started the idea in April 2010. I did the Summer Soiree in June, and then I really officially launched about January 2011, when the club season really got underway, is when I really started to pick up and gain some traction with my business. Chris McGown: Awesome. Just fascinating. What was the initial response when you were talking to coaches, when you called these 100 coaches? Were most of them like, yeah, yeah, I’ve heard it before? What did they say? Kara Hill: Some hung up on me. That should not be a surprise. Chris McGown: Yeah, yeah, thanks. How’d you get through my secretary? Yeah. Kara Hill: That’s exactly it. You know, initially when I started calling, there was; I think some were impressed that I had taken the time to actually call and understand what their needs were. I had explained to them, I said, you know, I’m not sure where this journey’s going to take me, but I envision building close relationships with my athletes, and really helping to guide them through the process. I had wanted to tour campuses, and really help them every step of the way through the process, which is probably the thing that makes me most unique, in recruiting as a whole. There’s not that many people in the industry that actually take the time to maybe go to a practice, or go to the college matches, and actually see the level, so that you can guide these kids the right way. Definitely, I got some good feedback. I got people that hung up on me. I had people that gave me some fairly good advice, or just said, we don’t need services like you. It was a real mixed bag. Part of that comes from some of the larger services that are out there. Services that are more of, we’ll edit your video and we’ll email this out on your behalf. I found that so many of the coaches were resistant, and saying, please tell me that’s not what you’re doing. I had said, no, no, no. My vision was to really get to know my client and their family. Understand what the athletes were looking for academically, athletically, socially, geographically, financially, and then even as a coaching fit. What are all the different angles and what would the perfect fit look like for an athlete? Now, you know as well as I do that a student athlete going through the process has literally no idea what the hell they want in their experience, but their parents have pretty good insight as to where they could see their child maybe being the most happy, or the most fulfilled. So, we really spend time developing a pros and cons list of things that they might be looking for, and really help guide them that way, if that makes sense. Chris McGown: Yeah, absolutely. Okay, I’ve got so many questions here. This is awesome. Let me start first by, let’s just take me through what you would see as start to finish. I’m an increasingly younger, we can probably get to that as time goes on here, but, I’m a young volleyball athlete, I think I’d like to play at the university level. I’m playing on a high school team, or a club team, and I say, hey, Kara, I’d like to engage your services. What does it look like, to the point that I’m actually playing on a university team? Kara Hill: Sure. So, one of first things that we do is, we do about a 45 minute to an hour consult with the family, to discuss academically where the athlete is. We typically look at either film, or we will have seen this particular family at a tournament, and kind of get a gauge of where they are athletically. Sorry, Your Mom Was Right! Academics MUST Come First. Chris McGown: Could I stop you there? I think that that’s one of the more frequently discounted parts of the recruiting process. A lot of these schools, and especially at the elite universities, they are constrained by the athlete’s academics to a large degree. While a lot of schools will work with their athletes, and hey, you’re going to go in with a GPA that might be less than general population, because you’re an athlete, we can give you some consideration there, but that’s still a big factor for a lot of school, and kids eliminate themselves all the time, academically, from their options. They close those doors simply because they haven’t taken care of the academics? Kara Hill: Absolutely. There are, a lot of families will come to us, and they’ll be using volleyball as a leg up to get into a top academic school, but perhaps their counselor may not have the best idea or understanding of how the process works, and how you can actually use volleyball to get a leg up. So, we talk about minimum requirements, for example, for AP courses. I talk, I spend a lot of time with the Ivy coaches, with really all the top academic programs. Part of that has to do with the relationships that I have in the world with many of the kids that are actually targeting these schools, so these are coaches that I have super tight relationships with as a result, and just understanding from their perspective what they need in order to be able to get somebody into the program. We talk about, academically, in terms of test scores, what they need to aim for, based on position, even, and then also, we focus on AP courses and things of that nature. Honors courses. Just ensuring that we focus on schools that’ll be a fit, based on where these kids are. Chris McGown: Okay. We’ve got to ask, of course, by position, I love it. Do you need to have a higher test score if you want to be a setter than if you want to be, maybe a middle? Give the middles a hard time, here. Chris McGown: Oh, yeah, because. Yeah, go ahead. Kara Hill: Typically, these guys really [UNKNOWN] is off the charts, academically. They have something many of these top schools have an academic index, an AI, so everything is calculated by percentage. So, you can have, for example, a super high academic libero to help offset, so if you have a middle that you want to get into the program, you can use your libero’s GPA and test scores sometimes to help you. There’s a calculation that’s done at the administration. Chris McGown: Sorry, a little technical difficulty there. So, tell us a little bit more about this academic index for athletes. Kara Hill: Athletes have a certain, they have a GPA and their test score, and there’s a calculation at the admissions due at certain prestigious institutions, where they actually look at your test scores, they look at your GPA, and you have to get within a certain point system in order for the college coach to support your application to get you into any given school. What I mean by, based on position, typically, the libero position is a dime a dozen position, as we can all agree. They are the ones that get the least amount of love, and unfortunately, it means that they need to be even higher academically. So, students that have over a 4.0 GPA, in most circumstances, and are scoring definitely above a 30 on the ACT, but if they can get a lib that can score a 32 or higher, that would be a dream, in essence. Chris McGown: So, basically, we’re using the liberos to kind of buoy up the overall team score, here. Kara Hill: For sure, for sure. Kara Hill: So, for the libero position, they tend to be a little bit higher. If you have a middle, or an outside, especially a terminating outside, or a great middle, and maybe they’re not as strong, you can use the other athletes on the team. You just have to fit in with this certain point value in order for the college coach to get all these athletes in. Chris McGown: All right. So, we take a look at their academics, then you mentioned you start evaluating their athletics. Chris McGown: You look at film, you’ve maybe seen them play. Kara Hill: And, when we do that, we’re very blunt and direct, and straightforward and to the point. You know, if you come to me, and you say you want to play at Stanford, and you’re not Stanford material, that’s the first thing that you’re going to get out of my mouth. Like, listen, I understand your goals. We can have some high reach schools in here, but at the same time, I think it’s incredibly important that we focus on schools that probably are going to be a closer fit, and then what my team does is, once a family contracts with us, we put together a targeted list of schools of about 60 programs, initially, to get started. We help them with their video editing. I have a team of video editors. A family will upload raw film from a tournament, we’ll break it down for them, and edit it to about 2.5 minutes, and then help them with their emails, so they’ll create, initially, in the first round, we’ll do more of an introduction email, obviously, to the coach and the program. Then, as the athletes start emailing their emails out, and getting their responses from the coaches, they’re forwarding everything to me, or to Sam Wolinsky, who’s kind of my right hand man in all of us. Between the two of us, we just go through, really understand what the college coaches are saying when they respond, and then we help create a strategy based on every body’s response. There’s a strategy for every kid, based on what they’re looking for in their college experience. It’s pretty much like a chess game, and we go from there. With our service, we’re very hands on. We’re talking to the athletes at least twice a month. We attend all the major recruiting tournaments in the country, and get in the gym, and try and advocate the best that we can, and talk to everybody in the industry to just get an understanding of what their needs are, but we’re there to really help alleviate some of the pressure, and help streamline the process for the kids, so that they can ultimately be successful at finding their perfect fit. Chris McGown: Okay. We talked a little bit earlier, and I think I want to look at this a couple different ways. I’d like to, we talked about the recruiting is really this interesting intersection of probably four parties. You’ve got the athlete, you’ve got the athlete’s parents, you’ve got the club program, quite often, or the club coach, or just the club itself, and then you’ve got the university coach, all of whom have potentially conflicting interesting, and some obviously aligned interests, and you’d like to think that everybody has aligned interests, here, but clearly, everybody has different drivers that are pushing them along, and compelling them in certain directions. So, if you had to say, let’s take it from each perspective, if you had to say this is maybe the 1 or 2 most important things to consider, based on your experience, what you’ve seen, do these things really well in your job, and you’re likely to have success, what would you say? Let’s start from the athlete. Do these 1 or 2 or 3 things really well, and you’re likely to have a successful, not only recruiting process, but maybe, university experience. Kara Hill: So, from an athlete’s perspective, more and more, building a relationship with the college coaches at each staff is excruciatingly important. Taking the time to be very specific, to be creative, in your emails or your content, as I call it, you need to be in close communication with these coaches, really, ultimately, building a relationship. Consistency wins out. I’ve seen time and time again a college coach take an athlete who may not be as strong as another recruit on his or her list, based on the relationship, and the time that that athlete spent in the recruiting process. It becomes harder to say no if you build a relationship with the coach. We’re in very interesting times now, where college coaches are losing their jobs left and right. I was at the AVCA convention this year, and many college coaches lost their jobs due to parental involvement. Chris McGown: Yeah, I’ve had some close friends that have lost their jobs, not because they were bad volleyball coaches, but because parents didn’t like them. Kara Hill: That’s absolutely, 100%, accurate. So, Sam Wolinsky is somebody I just recently hired. She had the 2nd largest RPI jump in Division I volleyball, improved their overall record tremendously, and she lost her job. Now, it was in my benefit. I was able to hire her and bring her on. She’s a college coach with over 20 years experience, which has been, for me, an incredible life saver, and tremendous value for our clients, but in terms of what’s going on, and the climate, we really spend a lot of time with our athletes and their families, creating boundaries, and understanding that this is a process. This is not something that’s going to happen overnight. It is not magical by any means, and that building relationships, and understanding that piece of the process is just so important. Especially in the nature of the business, at this stage, with college coaches moving as much as they are. All the transfers and stuff out there. You can’t afford to burn a bridge, as an athlete, or as a family. A lot of us talk about entitlement, and some of the challenges that that’s represented, in the industry, and in the business, but we really focus on educating our parents and our athletes on the reality of getting through this process, and then also, understanding how important building a relationship, is. Chris McGown: So, maybe the number one thing on your list if you’re an athlete, work to build relationships with the coaches at where you want to go to school. If there’s a number 2, what do you think? We’re going forward with the understanding that you’re working on your game, right? You’re trying to develop yourself as an athlete and as a student every single day. Maybe that’s a given. Work as hard as you can to become a great volleyball player, and a lot of the problems get solved. Chris McGown: Yeah. So, is that the other thing? No excuses? Kara Hill: Absolutely. Whether you’re playing or you’re not playing, what are you doing to make yourself 1% better every day? So, that’s some thing that we talk about, in terms of getting through this process. What can you do to make yourself 1% better every day? On the court, as a teammate, off the court. Whether you’re in the gym or in the classroom, we want you to be the best that you can be. That’s important in the process. Time and time again, we find that there’s always excuses for why Susie isn’t playing, right? Oh, the coach doesn’t like my daughter, the coach is this, the coach is that. We push back, and we’ll say, great, so what is Susie doing in practice, and how can we help you with understanding what you need to do in order to be better? Stop making excuses. Sometimes, there’s athletes that are just better, right? So, we talk about that, as well, when you’re on a team that’s high reaching. In terms of the most important things you can do as an athlete, to get through this process successfully, it’s building relationships with the college coaches. When I say building relationships, that means you’re running a very consistent campaign with lots of video. You’re sending an updated highlight reel, every single month, to show your growth and progress as you get through this process. Little Susie is doing it herself in that she’s sending the emails, and she’s setting up phone calls, and she’s really managing the process. It’s a lot of work, but it means there’s going to be some sacrifice here, and you, as a former college coach, can be very clear about the sacrifice that you make at the next level, especially if you’re going to be a paid athlete to go. If you’re getting your education paid for, this is a career move, so really understanding what you’re signing up for, and understanding that you’re getting paid to play at the next level by having your education taken care of, and potentially, cost of attendance. Really, really being consistent and managing this process effectively is going to be the most important part of actually getting through successfully. Chris McGown: Right. I love that message of no excuses, too. I mean, I just think that carries so much weight if you can go forward with that, not only during this process, but when you get to whatever level you’re at. Just a hey, look, I’m not going to provide excuses, I’m just going to get back to work. That’s awesome. Kara Hill: Well, and the reality is, no one cares, right? You can make excuses until you’re blue in the face. Maybe your mommy or daddy cares, but outside of that, no one cares, so save it, and figure out how to take ownership of the process, and do what you can to be a better, even human being, for that matter. Chris McGown: Right. Let’s look at it now from the perspective of a parent. If you could say, based on your experience with what you know, parents obviously need to be involved. You’d like them to be involved. But here’s, maybe, if you’re a parent, here’s the most productive things you can do to make this process good for every body. Kara Hill: Money is a key factor in this process. This process is expensive, right? Because you have to travel around the country, often times, and get on college campuses. The role of the parent is to be supportive, and to not, the problem that I have found with parents is that, when they’re in a panic, their kids panic, and they start to get very, very uncomfortable. It makes the kids absolutely insane. So, what we try and advise with our parents is, listen, typically I have prior conversations with the parents, versus the athletes. We tell the athletes what we need to tell them in order to encourage them to stay motivated through the process, and to relax, and just know that everything is going to work out. Whatever is meant to be is meant to be. With the families, we talk about time management, how they can help, in terms of time management, how they can sit down, maybe, with their son or daughter once a week, and really talk about how things are going, how they’re progressing, setting up the calendar to figure out when they can get on campus visits, ensuring that the phone calls are being made, and maybe even some role playing, in terms of what to expect in a phone call, when they’re talking to a college coach. It’s very similar to a job interview. As parents, if they’re playing club volleyball, I’m sure they’ve been through the interview process a few times. That’s really what we preach. We preach being supportive on the sidelines, and being a listening ear for your child, but also being realistic. If you’re not realistic, if you’re playing into, I want to go play at Stanford, or Ohio State, or Penn State, and you’re telling your kid, hey, dream big, there’s another message to that, as well. I’m all for dreaming big, but I’m also all for being realistic, so you’re not setting your kid up for failure. Chris McGown: For me, just hearing you talk about this, kind of the role of the parent is more support than active direction, perhaps. Kara Hill: Mainly, yes. The calendar is a huge piece. If they could sit down, look at the calendar, and figure out all the tournaments that they’re going to be going to. You can look at University Athlete, for example, and see which college coaches attended last year. Getting an idea of who they can target. There’s certain back end, background stuff that they can do for their athletes. Some parents will send emails on behalf of their kids, but be little Susie. I’ve known some to do that, especially when you have these kids that are taking 3 and 4 honors and AP classes, and trying to manage it all. That is something that’s certainly valuable, if they can do some of that, but it’s really communication, and positive guidance, and not getting into a negative place because you’re frustrated with the process. If you follow every thing that I’m saying, if you send very consistent emails, with video, on a month to month basis, and you’re targeting schools that are truly an athletic fit, this is impossible to be not successful. What happens is a lot of people aim too high, and when you aim too high, there needs to be a story to go along with that, for you to aim high, if that makes sense. That’s typically where Sam and I will come in, and we’ll talk to a coach, and we’ll really share a story about why we feel this kid could potentially make an impact in their program. I don’t know if that makes sense, but sometimes, these kids have some pretty compelling stories. Overcoming cancer, overcoming some major challenge in their life. Being new to the game, and having so much to offer. Being an incredible teammate, where maybe it’s not about the scholarship money, but there’s a little bit more that they need to know about this family before they cast them off and move on to the next one, so I feel like that’s where we come in, and really help with that strategy of understanding how we can make them human, through this process. Chris McGown: Okay. My experience is, quite often, the parents do more damage in the recruiting process than they help, a lot of times, because the college coach is talking, trying to get to know the athlete, and here’s this overbearing parent, it’s just, boy, I got 4 years of this, or 6 years of this, to look forward to, if I enter into this relationship with this athlete? Yeah. Let’s jump to the next one. If you’re a club coach, and you’re involved in this process, again, thinking about hey, here are the 1 or 2 most important things you can do as a club coach to facilitate this process for the athlete, what would you say? Kara Hill: You know, a lot of coaches have a difficult understanding of what their role is in the process, so at times, this can put me at odds with a club coach. Typically, what we recommend is sitting down with your athletes at the beginning of the season, for example, especially if you have recruitable kids on the team, getting to know them, and asking questions about what they might be looking for. I think one of the biggest mistakes that club coaches make is, they’ll say, give me the list of schools that you’re interested in, or they don’t tackle it at all, they don’t say anything at all. What makes it a challenge is if a college coach approaches you about somebody on your team, and says, hey, I’m really interested in your outside hitter #10, what can you tell me about her, I think it’s really important that they have an idea of where they are academically, and maybe some of the things that they might be interested in their college experience. I work really closely with Academy Encore Volleyball Club, I do a lot of stuff with Tstreet Volleyball Club, and so some of the stuff that we’ve put into place in clubs like this, where we come and we want to be of help, we want to work together as a team, so that any of the athletes that we have that become clients, we’re sharing information, and we’re supporting each other through the process, which is important. You want consistent messaging. Going out to the college coach if they’re asking any questions about a kid. So, I like to get feedback from the club coach to understand how is little Susie on the court? Is she a good teammate? Is she doing this, is she doing that? I like to understand those things, as well, so I think at the beginning of the year, or at any time of the year, if you can put together a questionnaire to understand who your athletes are targeting, and then maybe sit down and have a conversation like, gosh, you’re targeting some pretty high level programs, here, and you’re not necessarily going to fit into these programs. This is a mistake that’s made time and time again, by the way. Maybe giving some perspective to say, look, why don’t we put in a few Division II schools, or a few Division III schools. Really cast a wider net, and as the athletes start gaining traction, it becomes easier for them to buy into the process. As a club coach, getting to know your athlete, and understanding maybe some of the things that they’re hoping for, to play at the next level. I’m a huge proponent of saying, give me the list of schools that you’re talking to, so I’m not caught by surprise if a college coach approaches me and says that they’re interested. The 1st thing that comes out of some of these guys’ mouth is, I didn’t even know she wanted to play at the next level. So, really getting to know your athletes I think is the most important part for the process, for them to be successful at really being supportive for them. Chris McGown: Yeah. You know, the other thing that, in my experience, that I’ve found was really good if you’re the club coach, is to develop maybe a reputation for absolute credibility. Chris McGown: Just, I may love this kid, but I’m going to be dead honest about every single one, and if she’s no good, I’m not going to sell her as being great. I’m going to be realistic with the coaches. That, to me, was the biggest issue. I’d find club coaches that obviously, it’s really great for your club if one of your athletes goes and plays at a high level, that’s a nice thing to be able to say, hey, this kid went through our club, and she’s off to Stanford, or Penn State, or Nebraska, or something. That’s pretty neat, but as soon as you make a bad call on a kid, it’s really hard for every other kid down the road to be taken seriously if you’re giving the recommendation. Kara Hill: Overselling the kid ultimately hurts the kid. Kara Hill: I think one of the things that I run into is a club coach who oversells their kids, and they’re like, oh, she’ll be able to handle it, not really understanding what they’re committing to when they get to the next level. So, there’s a very popular coach that’s here in Southern California that literally oversells every single kid that he works with. The problem is that once they get there, they’re set up for failure from the start. They’re told that the transition is going to be so easy. These kids have this vision and idea of what it’s going to be like to play at the next level, and they really don’t have a concept or a clue of what they’re buying into. I think for me, the educational part of really knowing what it is that you’re signing up for is super important. Knowing that this is a job, and it’s going to be difficult. And, as a club coach, when you oversell a kid, the transition is not easy, and your reputation is affected, in a big way. Chris McGown: Right. Finally, moving on to the college or university coach, your experience with the athletes and with their parents, just kind of seeing them along in the process, what do they want? What can a college or a university coach do to maximize their probability of success in recruiting? Kara Hill: I’ve done a lot of mentoring with different college coaches who are trying to close on a top recruit, and ask different questions about how they can be more effective. What I have found is, face to face communication is so important. So, adding little things such as Skype and FaceTime into your recruiting process, where you can really look them in the eye and talk to them, and build a relationship with them, again, the relationship piece, it’s so hard to say no to some body once you’ve built a relationship with them. Social media, some of these guys are getting a little bit better with their social media. I’m not sure that they’re spending quite the amount of time that they need to, to really help sell their program. But the power of social media is just incredible. Of all the different things that they could be doing to really help sell a program. If you’re in a small town community, and you’re trying to attract different athletes, and you’re trying to close in, you’ve got to sell the charm of what your community has to offer by doing so many different things. Chris McGown: So, what are the best venues these days for social media, have you found? And, when you say social media, what exactly? Is it the individual coach’s page, site, or account, or is it more the university, the volleyball program, for example? What do you see are the most effective platforms? What’s the messaging that should be coming across? Kara Hill: In my opinion, everybody is a personal brand at this point. By personal brand, it really just means your reputation, right? So, as a coach, if you are a family man, or a family woman, being able to show some of the things that make you human and love your kids. As a parent, and as an athlete, I would want to know a little bit more about your family, and maybe what goes on. We all know how much time you spend on the road. Your family’s bound to come around, right? I think as a college coach, opening up a little bit about your personal life is a huge piece at closing in on some of your top recruits. Facebook, SnapChat, Instagram, those are the power three. Twitter is not as popular in this age group. Certainly they’re on it, but SnapChat and Instagram are the leading tools that virtually every 13 to 18 year old athlete are on. Also, musical.ly, if you can find really cool ways to interact on musical.ly, and get those preteen kids buying in. Chris McGown: Don’t get me started on musical.ly here, yeah. Kara Hill: Exactly. Really cool and interesting things. The girls on the college team, or the guys on the college team, they’ll do goofy stuff with it, and it just gets you excited, like I want to be so-and-so’s teammate, or I really love what they’re doing here. I think you need to be creative with your content. I think that, as a college coach, you need to go to, if you’re clueless, you need to spend a few hours a day getting to know these social platforms, and stop making excuses about you don’t have time or you’re not interested, because this is the way that every body’s communicating these days. If you want to close on your kids, then you’re going to have to get with the times, and you’re going to have to spend a lot of time working on it. We say social media, we say branding, but really what it is, it’s your reputation. So, do you want your assistant coach running the quote, unquote, reputation? Do you want them in charge? Or do you want to be in charge of the messaging that’s going out? And find a way to relate by being creative. To the video department, there’s a media department, or a communications department, obviously, at just about every university. Going to them and talking to them, trying to get them engaged or involved, most schools have internship programs that they have to volunteer about 120 to 125 hours worth of their time. Going and talking to those guys, inviting them to come into your gym, or hitting road with you as part of your internship so you get free work out of them, they have to do it anyway in order to graduate? So, getting them to buy in, and getting creative ideas for how you can create content with your athletes. These are all things that I think would help, in terms of showing what your program is all about, and creating more interest, and getting more people to show up to your facility as well. Here’s maybe a way for a university coach or a college coach to work harder in ways that, probably, are a little smarter, too. Chris McGown: The other, I don’t think we’re changing the world here, you and I, tomorrow, but one of the big issues, of course, is just the ever, I suppose, decreasing age at which these young people are asked to make commitments, or are starting to be recruited. I’m walking around Triple Crown a few weeks ago, and I’m watching some high level volleyball, and coaches are stopping by saying, good to see you, I’m headed down to the 13s court, or I’m headed down to the 14s court. It’s just this preposterously young age at which athletes are starting to be evaluated. Again, if I had it my way, we’d legislate against that sort of thing with the NCAA, but in the absence of that, what do you think are the best strategies for parents, for kids, for college coaches, other than patience? That was what I always tried to talk to my athletes about was, look, just be patient. If you’re good enough, schools will wait for you. If you’re good enough, you’ll be in demand, all the way through your senior year, if you want. Somebody will have a scholarship out there for you, if you’re good enough. So, patience, it’s okay to be patient, and it actually serves you better, and it probably actually serves the university coach and the college coach better if you’re patient, as well. But, any other advice you have, as things keep trending younger? Kara Hill: As parents, when I go in and I speak at different clubs, one of the things that I do with parents, or the team moms, is to talk about organizing visits at every turn. You’re already investing. In Southern California, to give some perspective here, these families are investing $8 to $20,000 a season, with everything, right? Kara Hill: So, when you’re making that sort of investment, and you want to make that investment. Chris McGown: Mine’s just blue right here, right now. People are falling over hearing these numbers, but that’s reality in Southern California, I think, especially in the wealthy areas. Kara Hill: For sure. When you’re, even in our non wealthy areas, by the time you factor in your travel, and you start looking at where you’re going around the country, it’s mind blowing the amount of money that’s being shelled out, some of them with the hopes that they’re going to earn a college scholarship, and for others who are hoping to get a leg up into a top academic school because the reputation of the institution is important to certain families. One of the things that we talk about is getting on college campuses every opportunity that you get, so that you can understand what it is that these schools have to offer, and what you’re buying into. I think the more education that these kids can be exposed to, of what opportunities are out there, it makes it a little easier. If you’re making decisions at a young age, and you have an opportunity to stay local, a lot of times I tell these kids, look, if you have an opportunity to stay local and your family has an opportunity to be at all your matches, you’re going to have good days and bad days. When you’re younger, it sounds easy to say, hey, I’m going to go across the country and I don’t care. I’m going to go to New York, or I’m going to go to Florida or Nebraska or where ever, and I don’t mind being this far away from home. But by the time your junior and senior year hits, it becomes more and more challenging, and you start to go, wow, I’m going to be really far from home. There’s a lot of things. I think just taking these kids on these campuses at a young age, and giving them exposure, taking them to the college matches, interacting with the players on social media, trying to get to know them, and what it’s like, education is the key to success, in my opinion. If you’re going to make a decision at a young age, I think having these real conversations with your daughter or your son, mainly your daughter, mainly it’s on the women’s side where they’re making these decisions so young, it’s the power of education. Of visiting as many schools, different types of schools. It doesn’t even necessarily mean that you have to visit all DI schools, and be talking to just the DI coaches. Get out there and talk, and learn about what is out there. As parents, I think that’s where they can really come in and help guide their children. Don’t get caught up in the amazing facilities that are there to attract you. Really start thinking about some of the things that you’d like to do even after college. We talk about different discussion, important discussions to have at family dinner. That’s some thing that we talk about with our families. These are some of the questions that you guys need to be considering, and the kinds of conversations that you need to be having. If they do those things, they’re going to be more likely to be successful. The other thing that I’ll tell you is, in mind, no one’s safe when they’re recruited. Especially if you’re being recruited from a young age. I mean, the chances of you experiencing coaching changes in this day and age is pretty huge, so as you said, about being patient, being patient, you can afford to do at this stage, because there’s just so many changes all the time. Chris McGown: Right. Well, hey, I know you’ve got stuff going in your day. I just want to thank you again for the time. This has been really, I think, interesting for me, and of course, hopefully a lot of value add for the people that listen to the podcast. We wish you the best of luck, and I’m sure we’ll see you out there on the road. Kara Hill: Thanks so much. Yeah, this was awesome. Chris McGown: Okay, we’ll talk to you soon. Thanks again. Kara Hill: Okay. Take care. Chris McGown: If you want more podcasts, articles, videos, and other volleyball instructional resources, you can find us at goldmedalsquared.com, on our YouTube channel, on Facebook, Instagram, and on Twitter. Follow us on Facebook, Instagram, and Twitter, for the latest interviews, news, and other promotions. Thanks for listening, and we hope to meet you in person at one of our camps or clinics. Please visit her website, or follow her on Instagram. Are you a beach player? Kara Hill has also co-founded the new Beach Partner app. You can find the app in iTunes COMING SOON. Complete the pre-registration form to gain early access to the app. The first 100 registrants will win FREE Beach Partner swag! Thanks Chris, This was an engaging podcast.